Anyone who has ever watched a World Series game is familiar with the work of Harry Coyle. 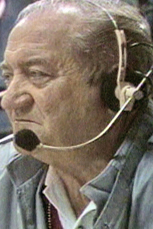 A director who spent 42 years creating the on-air look of baseball games, he was the thread connecting the first 35 televised World Series, and his innovations changed productions throughout the sports world. After serving as a fighter pilot in the Armed Forces, Coyle was a part-time director at NBC before joining the network fulltime in 1955, where he quickly became a fixture in the world of baseball. Coyle took the black-and-white, three-camera broadcasts of the 1940s into the 14-camera future, introducing hand-held cameras, close-ups, and player reactions into his 36 World Series and 27 All-Star Game productions. In the 1950s, Coyle introduced a center-field camera that allowed viewers to follow the path of a pitch all the way into the catcher’s mitt. The angled camera, now standard in baseball coverage, was a radical departure from the above home-plate, infield angle. Coyle’s most famous reaction shot came in Game Six of the 1975 World Series. Boston’s Carlton Fisk led off the bottom of the 12th inning, and Coyle directed the cameraman inside the Green Monster to follow the ball, but a large rat had stolen the cameraman’s attention. Petrified, the cameraman never moved as Fisk hit the game-winning home run, and he caught Fisk as he frantically motioned for his left-field hit to stay fair. It was one of the first shots of an athlete’s emotion captured in the moment and made Coyle a directorial prodigy. Although the director was as powerful an executive as anyin the business, he never acted like one. In addition to the close-up shots that distinguished his work, Coyle also introduced slow motion and instant replay to baseball games, forever focusing on the story, not the statistics. Since Coyle’s retirement in 1989, little has changed in baseball production, which is a testament to the standard he set. There may be more than one way to shoot a game, but Coyle found the best way to share baseball’s stories with the world, and his work remains the yardstick against which every production is measured. Bob Costas introducing the Harry Coyle tribute video.